There is no necessary connection between the sounds of a word and what that word signifies. This primary principle, called l'arbitraire du signe (the arbitrariness of the sign), we associate with Ferdinand de Saussure (Cours de linguistique generale , i.e. Course in General Linguistics, 1916). God already knew this and thus his curiosity in having Adam name the creatures 'to see what he would call them' (Gen 2:19). Pagans, however, have tended to believe in the magic of the sounds.thus their abracadabras, incantations, mumbo-jumbos, and mindless mantras. There are no instructions or admonitions on how to pronounce words in the Bible. There is, of course, the word "Shibolet" which served to distinguish the Ephraimites who couldn't pronounce the "s" (sh as in shoe) rather they pronounced the word sibolet. But this was no instruction on how a word should be pronounced, rather it was a test to distinguish a particular dialect. The KJV has "for he could not frame to pronounce it right" (Judges 12:6), but the Hebrew word "ken" [translated as "right"] need not mean "right" (as opposed to "wrong") but rather "so" or "likewise" just as the interrogator had pronounced it. One of the greatest treatises ever written on phonetics (and grammar) is the "Ashtadhyayi") by the Hindu Panini that was composed in the 6th century BC. It was important that the Vedas be chanted correctly. One sees no such concern among Israel's prophets of the same period. Their concern was not sounds but meaning and behavior based on the meaning of the Torah. The musical "My Fair Lady" features Henry Higgins, a kind of caricature of the British phonetician Daniel Jones (1881 -1967). Pronunciation was important to the British. Because British society featured a class system in which dialect was a primary marker of one's position, and thus the great phoneticians (David Abercrombie, Alfred Gimson, Peter Ladefoged, Ian Catford, etc.) were British. American linguistics, on the other hand, has been predominately Jewish and more preoccupied with syntax and semantics. Yes, the Masoretes gave rigorous attention to the sounds of the language, to punctuation and to the chant, all for the preservation, reading, memorization, and study of the text. Nevertheless, it is the discussion and disputation over the meaning of the text that sets the Jewish tradition apart. We see now also a linguistic travesty: One initiated by the Marxists.and that is political correctness. Everything needs renaming.that which is evil by words with connotations of "caring" and that which is good by smears of racism, sexism, and all the rest of the Lefts list of cardinal sins. Shall I say "Mexico" just the way the Mexicans do, or might I pronounce the word as in English? Doing the former might be a vain demonstration of my superior knowledge, or it could stem from a self-righteousness, more "in solidarity with the oppressed than thou" attitude. Remember back during the Cold War when the Communists had taken over Nicaragua and our Leftists were falling all over themselves trying to pronounce Nicaragua more Spanish than thou? Might the same foible motivate some who aspire to pronounce the Name? Linguists also see in language two primary social dimensions: power and solidarity. For seminal studies, see Brown & Gilman (1960) and Labov (1966). Brown, Roger, & Albert Gilman. 1960. The pronouns of power and solidarity. In Sebeok, T. A. (ed. ), Style in Language, 253-76. Cambridge: MIT press. Labov, William. 1966. The Social Stratification of English in New York City. Washington, DC: Center for Applied Linguistics. There is the King's English, the speech of the ruling class, dialects that the people recognize as that of their betters. This dimension is perhaps less overt in American English. The other dimension, solidarity, we see a lot. Cowboys talk cowboy talk, professors talk professor talk, hippies talk hippy talk. Blacks will lapse into a particular vernacular to affirm their blackness, American Indians now sport a "pow-wow" lingo, and Jews will sprinkle in Yiddish or Hebrew terms when around other Jews. And there is now also a Messianic Movement, typically differing little or none at all from Evangelical or Pentecostal Christianity, except that they say Yeshua instead of Jesus, Kefa instead of Peter, Shabbat instead of Sabbath, etc. Is there anything wrong with this? No, of course not, but it can't hurt to know what we are doing. We are affirming solidarity with a particular group, not necessarily getting closer to God. If Yod-He-Vav-He [the Name of God in Hebrew lettering] translates as "the Eternal" or "the Ever-Living" then might it also be just as good to use that in our translations of the Scripture? 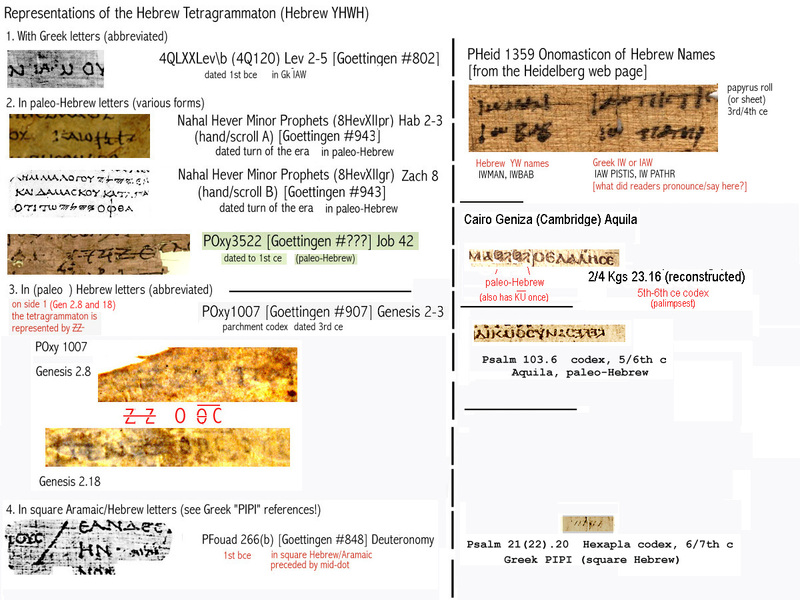 God's four letter name is most likely a Hebrew name with a Hebrew etymology. If so, then does that mean that the God of eternity, the God of the vastness of time and space, speaks Hebrew even on the other side of Andromeda? I am convinced that Hebrew was the language of Canaan, of the Canaanites, and that the patriarchs and their children learned to speak it in the land of Canaan. We may have to agree to disagree on this. God speaks to man in man's languages. If or when God speaks to the Gentiles, does he use his Hebrew name? Not so much in the past, no, but who knows about the future.